"The Russia scandal. It's total nonsense . . . It's a dark page in American history." Yet another feckless tweet from Donald Trump? No, it's Vladimir Putin's take on Attorney General William Barr's whitewashed summary of Special Counsel Robert Mueller's final report and a transparent acknowledgment that Trump's ascendancy to the presidency, in large part because of Putin's cyberespionage of Hillary Clinton's campaign, has gone far to fulfilling his vision of returning Russia to the Cold War glory of the former Soviet Union by undermining the world's last remaining superpower from within through a profoundly inept president whom he could effectively blackmail. Not in his wildest dreams could the Kremlin leader have imagined how deeply destructive Trump would be. Trump, for the most part, has undermined America pretty much all on his own. 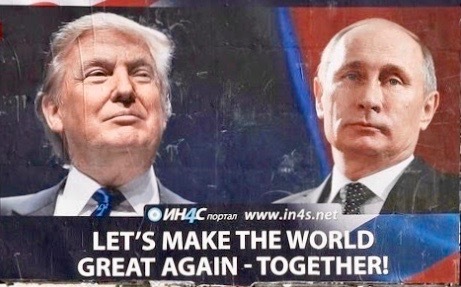 But Putin additionally has done such a roklyatyy shtraf (damned fine) job of getting Trump to dance to the Russian bear's tune that the U.S. has not been so destabilized since the post-Civil War years. Its global standing is at low ebb, never mind that its leader is mocked (and feared) by its allies as a vicious incompetent. Trump's undermining of American values and his abuses of power are encyclopedic. They range from trashing environmental regulations to politicizing the Justice Department to stacking federal courts with right-wing hacks with lifetime appointments to a profoundly cruel immigration policy that mocks the "huddled masses yearning to be free" credo inscribed on the base of the Statue of Liberty. The fight to unlock the dark secrets of Trump's personal and business tax returns is instructive in this context because the administration, in the person of Treasury Secretary Mnuchin, has all but said it simply won't obey the law under which House Democrats are demanding them. One West Wing figure of note has not just survived the extraordinary number of resignations, firings and wholesale purges under Trump, he has thrived because of them, and for good reason. The grip on power of senior policy advisor Stephen Miller, a right-wing zealot and . . . yes, white nationalist, has grown firmer and his influence on Trump more complete because the complicit but law abiding administration officials like John Kelly and James Mattis are gone, leaving Miller as the chief advocate for the very traits that have propelled Putin -- venality, corruption and lawlessness -- for the last 20 years. On a personal note, I have never felt so pessimistic about the future of a country for which I have bled red, white and blue. Impeaching Trump is more urgent than ever, but instead the monster who fires officials because they refuse to break the law and promises pardons to those that do is considered the frontrunner in the 2020 race despite his high crimes and misdemeanors and an earnest but haphazard effort by newly-empowered House Democrats to call him to account before the clock runs out and we're staring another presidential election in the face. And through it all Trump has never said a harsh word against Putin, let alone revealed a peep of what was said between them during their several hush-hush meetings, has worked to remove Russia sanctions, which was an unspoken quid pro quo in the 100-plus meetings between Trump campaign officials and Kremlin cutouts, and showed a notable indifference to preventing future election interference. On another personal note, I have consistently misunderestimated (thank you, Dubya) Trump's canny ability to look peril in the face and turn it to his advantage, which has been a key to Putin's survival, as well. Attorney General Barr not only is likely to have scrubbed the Mueller report of material damaging to Trump and his family when it is released in the next few days, but by falsely asserting that the FBI spied on the Trump campaign has endorsed the president's long-held view that the real scandal of the Russia scandal is that it has been a witch hunt from start to finish, never mind the 37 indictments, 199 criminal charges and guilty pleas. In yet another mind-blowing consequence of the counterintuitive age in which Trump rages and rules, Barr's imprecations actually seem to have boosted the president's approval ratings. If Trump does win reelection -- and a healthy economy may be cancelling out much of the crap, corruption and covering up for voters who should know better -- that means we are barely more than a quarter of the way through his presidency, and taking back the keys to what is left of the national car will be even more difficult. Repairing the damage he has done to longstanding international alliances will take years; repairing the federal judiciary will take decades. Did I say Putin won? Profoundly unsettling. But we must soldier on. Yes, but the good news is...uh, let me get back to you on that one! Sadly, I think many of us are in the same state of near despair, if not despair outright. We need a massive turnout for the 2020 election, but where is the inspiring equal of Barack Obama? Haven't seen that person yet. This is the classic case of something right in front of people's eyes that they somehow explain away by overthinking it. Having a candidate of Obama's gravitas would be significant, as would a robust turnout. But getting rid of Trump can't simply come down to another election, with or without Putin's help.